One lens to rule them all, one lens to find them, one lens to bring them all and in the natural light capture them. If J.R.R. Tolkien were a photographer, the One Ring would have been a superzoom lens. Superzooms are a one lens solution, covering a very broad focal length range from wide angle to mid-telephoto or longer. 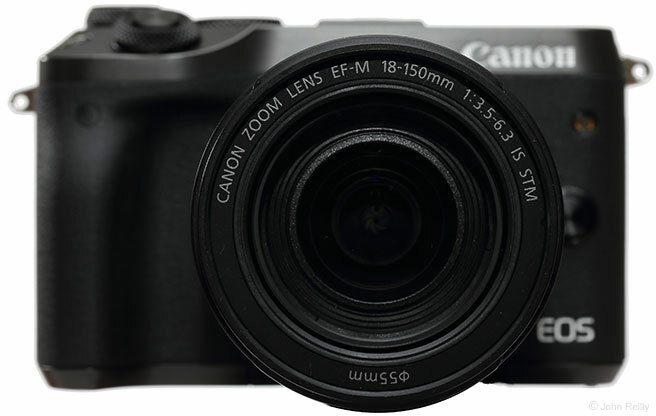 For the Canon EOS M system of mirrorless cameras, Canon's One Lens is the EF-M 18-150mm f/3.5-6.3 IS STM Lens, and it delivers performance that will make you want to keep it on your camera instead of throwing it into molten lava. The EF-M designation means this lens is compatible only with EOS M series mirrorless cameras, and not with any Canon DSLRs. Since the EOS M cameras all have an APS-C sensor with a 1.6x FOVCF, the EF-M 18-150mm lens delivers a 35mm full frame angle of view equivalent of approximately 29-240mm. Although there is no clear definition of the marketing term superzoom, it generally refers to lenses with over a 6-7x zoom range (max/min focal length) with the 8.3x zoom range of the EF-M 18-150mm falling at the lower end of a category where the envelope has now been pushed to more than 20x. Because a superzoom lens covers a very broad focal length range in a single lens, it can be a good choice for travel, especially one as small and light as the EF-M 18-150mm and particularly combined with the small size and light weight of a mirrorless camera. I frequently bring the EOS M6 and EF-M 18-150mm when traveling for business to take advantage of opportunities such as the image below, of the Middle Bridge over the Rhine River in Basel, Switzerland. In addition to being an excellent choice for travel, I find the EF-M 18-150mm a great one-lens solution for family outings, where I often need to shoot in a range of situations and don't want to carry multiple lenses and switch between them. 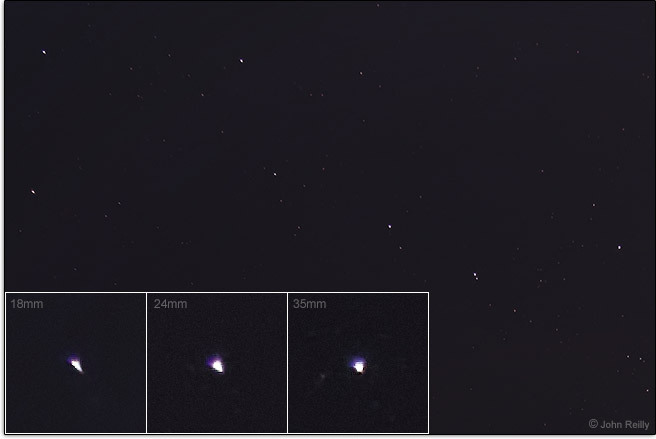 The examples above were taken at 18mm and 150mm, respectively. Like many zoom lenses, the EF-M 18-150mm has a variable maximum aperture that becomes incrementally narrower as the lens is zoomed from the wide end to the long end. Typically for Canon lenses, the maximum aperture at the long end of the focal length range is f/5.6, because that is the minimum aperture required to support the dedicated phase detect AF system on Canon DSLRs. Since mirrorless cameras do not have dedicated phase-detect AF sensors, they do not require a minimum aperture of f/5.6 for effective autofocus. The f/6.3 maximum aperture at the long end of the EF-M 18-150mm zoom lens results in a lens that is smaller and lighter than an f/5.6 version of the same focal range, and the loss of 1/3-stop of light at the long end is not likely to have a substantial practical impact. The following chart shows the incremental reduction of the available maximum aperture at longer focal lengths for several comparable lenses. From the table above, it is apparent that the EF-M 18-150mm has the least advantageous aperture step down progression, reaching f/5.6 and f/6.3 at wider focal lengths than other comparable lenses. This more rapid progression to narrower apertures is one of the tradeoffs for the small size and light weight of the lens. Wider apertures offer two main advantages – they allow more light to reach the sensor which enables a higher shutter speed to be used to stop action and/or a lower ISO for less image noise, and they allow greater subject isolation by delivering a shallower depth of field with greater background blur. The relatively narrow maximum apertures make the EF-M 18-150mm a "slow" lens which can make low-light shooting a challenge. Despite the relatively narrow f/6.3 maximum aperture at the long end, the EF-M 18-150mm can still achieve a strong background blur, as demonstrated in the 150mm f/6.3 example below. 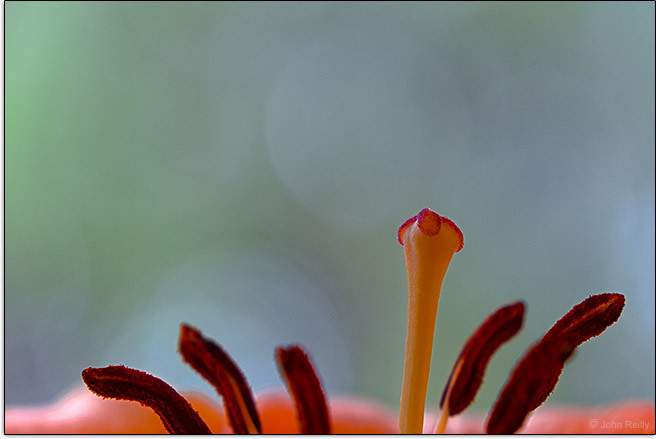 In the example above, the lily pistil and stamens are at/near the minimum focus distance and the blurred-beyond-recognition pine trees in the background are approximately 25' (7.6 m) away. Image stabilization can be a very valuable feature, particularly for a lens with a narrow maximum aperture and a telephoto focal length. Image stabilized lenses have gyroscopic sensors and a rapidly movable element group that together detect camera shake and shift the image projected on the sensor to compensate for it. This allows using a slower shutter speed than would otherwise be possible when handholding the camera, meaning a lower ISO setting can be used for better image quality. Note that IS will not compensate for subject motion. The effectiveness of an IS system is specified in terms of the number of stops the shutter speed can be reduced while still allowing sharp images to be captured. The IS system of the EF-M 18-150mm lens is rated for 4 stops of improvement, meaning that handholding the EF-M 18-150mm at 150mm should be possible at shutter speeds as slow as 1/15 s.
Under ideal conditions, indoors standing on a stable surface, I am finding that the EF-M 18-150mm is not delivering the full rated 4 stops of stabilization for me. At 1/15 sec. exposure, I am seeing only about 30% of images being sufficiently sharp at the pixel level, although if reduced to social media-friendly sizes, that percentage is closer to 70%. Achieving more than 80% sharp images requires a shutter speed of 1/25 sec., meaning the EF-M 18-150mm is delivering about 3-1/3 stops of stabilization, which is 2/3-stop less than the rated effectiveness. The example below shows a comparison of 100% crops from 10 sequential handheld images taken at 150mm, 1/25 s exposure with IS on, followed by single examples with IS off handheld, and IS off with the camera mounted on a tripod to show the maximum possible sharpness under these conditions. The IS system of the EF-M 18-150mm features automatic panning detection, meaning it detects when you are following a subject and will compensate for camera shake only in the direction perpendicular to the direction the lens is being intentionally moved. Although Canon has not stated whether or not the lens is tripod-sensing, my observations suggest that it is not, and thus when mounting the camera on a tripod the IS should be turned off, which must be done with the camera's menu options since there is no IS switch on the lens itself. The EF-M 18-150mm also features Dynamic IS which is active when recording video and compensates for the additional motion introduced when shooting video while walking. Manufacturer-provided charts of a lens' modulation transfer function can provide a first look at the sharpness and contrast that the lens is capable of delivering. For those not used to looking at such charts, Canon has published a helpful article on reading MTF charts. The MTF charts for the EF-M 18-150mm suggest that the lens will deliver very good sharpness and contrast in the center of the image with some loss of performance in image periphery, especially at the wide end of the focal length range. Based on the MTF charts, the image quality appears similar to, if not slightly better than, the well-regarded Canon EF-S 18-135mm f/3.5-5.6 IS STM Lens. Canon's MTF charts are not based on measurements of actual lenses, but rather on the theoretical performance of the optical design of the lens. For that reason, it is important to evaluate the real-world performance of lenses. In that context, it is worth noting that there can be some variation between different copies of the same model of lens given the manufacturing processes and tolerances in place. 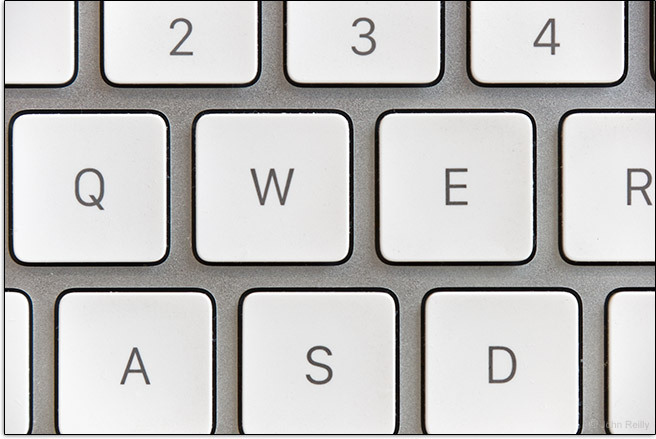 The example images below are 100% resolution center of the frame crops captured in RAW format using a Canon EOS M6. 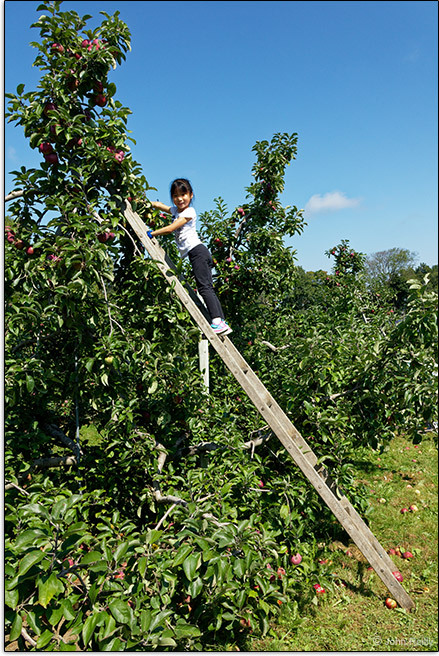 These images were processed in Canon's Digital Photo Professional using the Standard Picture Style with sharpness set to "1". Center sharpness is very good throughout the focal length range, with slightly higher sharpness at the ends of the range. Stopping down to narrower apertures provides very modest increases in sharpness across the focal length range, meaning the lens is delivering near-maximum center sharpness wide open. Below are real-world examples at the extreme bottom-left corner of images captured with a EOS M6 and processed as above. As the MTF charts indicate, sharpness is lower at the periphery of the image compared to the center throughout the focal length range and particularly at the wide end of the range. At 18mm, with the lens at its maximum aperture, the corners are noticeably soft. Stopping down increases image sharpness progressively through f/8, but the peak corner sharpness at f/8 remains lower than the center of the image. In the middle of the focal length range, wide open corner sharpness is somewhat better and improves further with a narrower aperture. At the long end, corner sharpness is reasonably good and only a slight benefit is seen with stopping down from the already-narrow f/6.3 maximum aperture. Overall, the EF-M 18-150mm delivers good sharpness across the focal length range which is an impressive performance considering the very broad focal length range covered by this superzoom lens. Vignetting occurs when less light reaches the periphery of the image circle than the center, a phenomenon which occurs to a greater or lesser extent in all lenses. Stopping down a lens to a narrower aperture usually reduces or effectively eliminates vignetting. 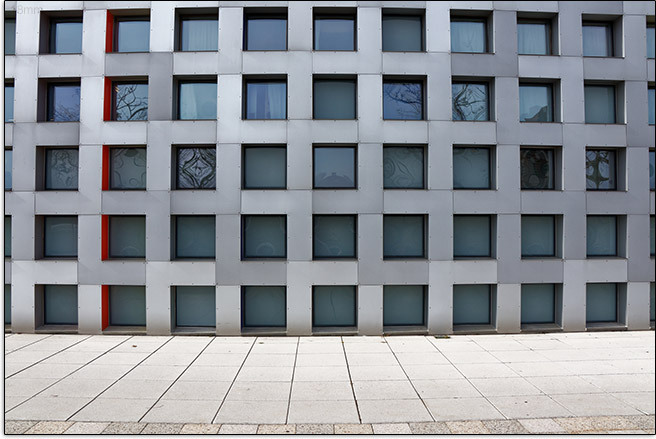 Below are examples of the vignetting seen at several focal length/aperture combinations for the EF-M 18-150mm lens. 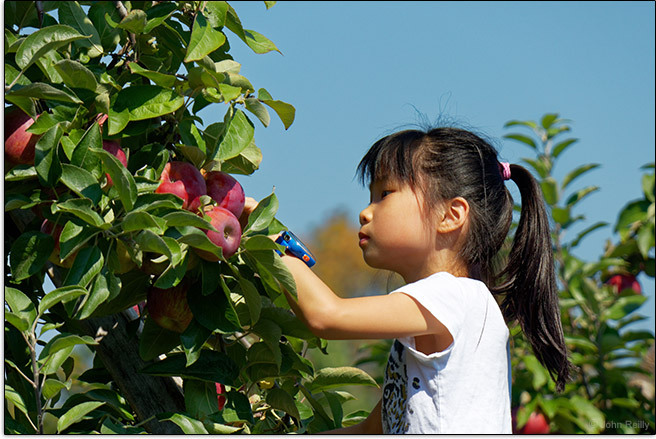 The EF-M 18-150mm does not suffer from severe vignetting. 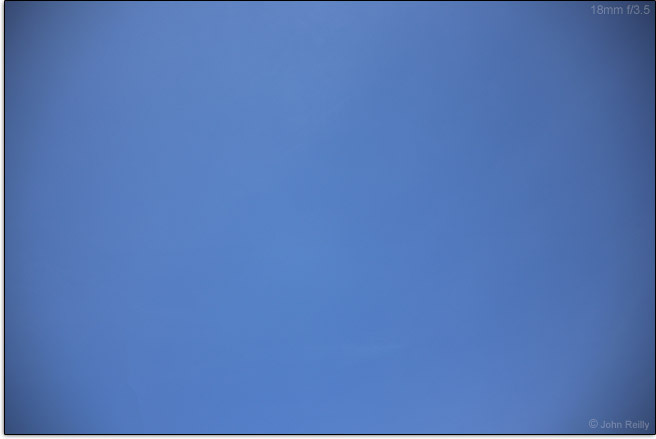 At 18mm, with lens at the maximum aperture of f/3.5, the corners show approximately 1.5 stops of vignetting. As the lens is stopped down to f/5.6, vignetting drops to about two-thirds of a stop. By f/8, there is essentially no vignetting. As the focal length is increased to about 80mm, vignetting at the maximum aperture drops to between one-third and one-quarter of a stop and stopping down to f/8 reduces the vignetting to almost none. However, as the focal length is increased from 80-150mm, wide open vignetting increases again, such that at 150mm f/6.3, the lens exhibits approximately 1.25 stops of vignetting, almost as much as at the wide end of the focal length range. 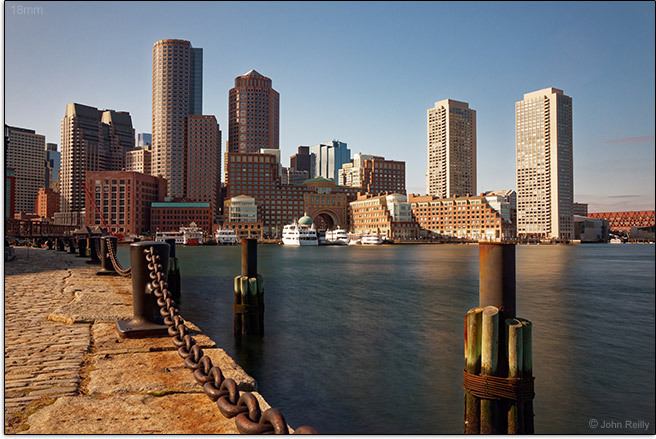 With a maximum magnitude of 1.5 stops, the vignetting is relatively mild and easily corrected during post-processing or in-camera for JPEG conversions. Lateral chromatic aberration occurs when different wavelengths of light are focused at slightly different places in the plane of the image. This optical aberration is absent from the image center, worsens progressively away from the center and is not significantly improved by stopping down to narrower apertures. Lateral CA is most evident at high contrast transitions and shows up as color fringing at those borders. The following examples are 100% crops taken from the upper left corner of EOS M6 images, showing an essentially worst-case, white-on-black scenario. The test chart has only black, white and gray, meaning any colors present are due to lateral CA. The final example shows CA (a combination of mainly lateral with some longitudinal) in an extreme contrast transition in the extreme corner of a real-world image at 18mm. The EF-M 18-150mm exhibits moderately strong lateral CA at the wide end (18-24mm), with almost none through the middle of the focal range (35-70mm). Some barely perceptible lateral CA returns by 100mm, and at the telephoto end that increases further to mild lateral CA. 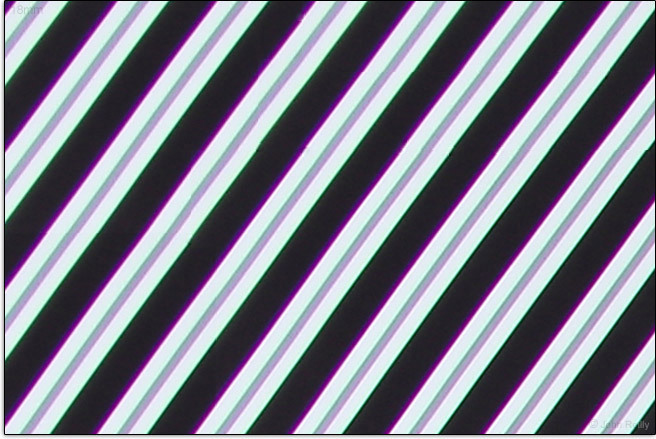 Longitudinal chromatic aberration results when different wavelengths of light are focused slightly in front of or behind the image plane. 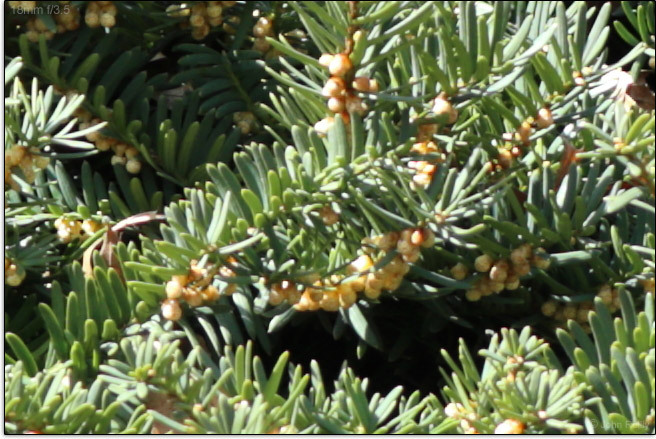 This type of CA can be seen throughout the image and is improved by stopping down the lens to narrower apertures. 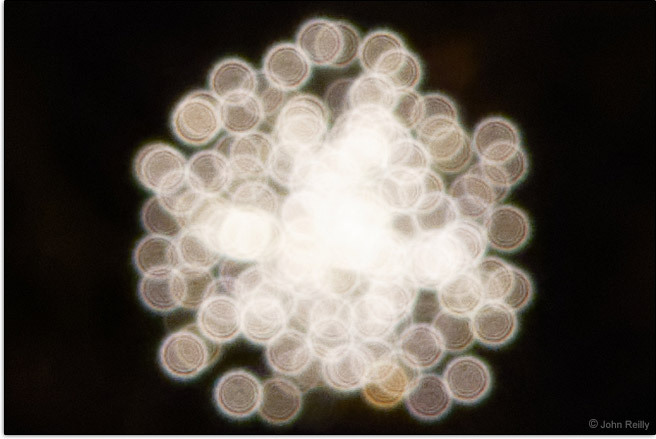 It is usually seen around high contrast transitions and specular highlights and is most evident in out-of-focus areas of an image, which is why longitudinal CA is also referred to as bokeh fringing. The following examples are 100% crops from images taken with the EOS M6. At 18mm, there is mild longitudinal CA at the maximum aperture that is progressively reduced with narrower apertures and is essentially gone past f/5.6. There is minimal to no longitudinal CA through the rest of the focal length range. 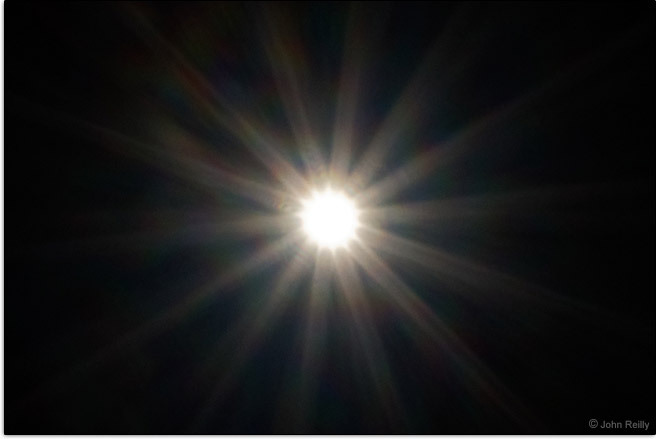 Lens flare occurs when a bright light source is within or just outside the image frame, resulting in internal reflections from lens elements appearing in the resulting image. The shape, color and amount of flare can vary depending on the nature of the light source and its position relative to the image frame, and the effects are accentuated in darker regions. 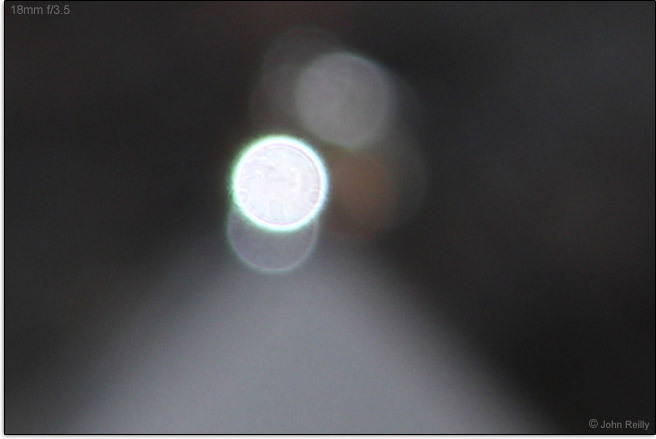 Unlike most lens aberrations, flare often becomes more evident as the lens is stopped down. 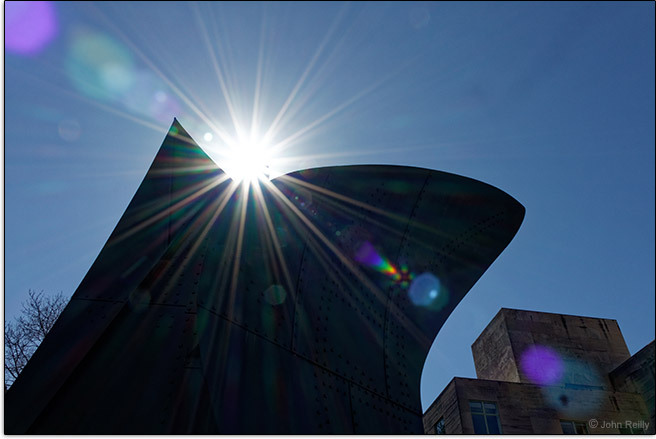 The image below shows an example of flare at 18mm f/18. As you can see from the example above, flare is not handled particularly well by the EF-M 18-150mm, at least in extreme cases. Unless your photography is strongly inspired by filmmaker J.J. Abrams, it is probably best to avoid including the sun in the frame. When selecting a lens for astrophotography, a superzoom lens would generally not be my first choice. However, bright point light sources against a dark background represent an effective way to evaluate lenses for two aberrations, coma and astigmatism. Coma results in the stars having a triangular appearance while astigmatism results in stars appearing as lines instead of points. Both are more evident at the periphery of the image and typically not seen in the center of an image. With a moderately wide 18mm and a not-too-slow f/3.5, the EF-M 18-150mm allows exposures of around 15 sec. without star trails and the use of moderate to low ISOs. The main image of the Big Dipper in the example below was shot at 18mm, f/3.5, 15 s, ISO 100. The inset images in the example above show 100% crops of Merak, the bright star that was positioned in the upper left corner of the images captured 18mm, 24mm and 35mm. At 18mm, there is noticeable coma in all the stars of the 'cup', although the stars in the 'handle' are far enough away from the corner to be unaffected by coma. At 24mm the coma is reduced, and by 35mm the stars in the corners are nearly round. The lens shows very little astigmatism. Lenses generally have some degree of geometric distortion, causing straight lines to appear curved, especially at the edges of the frame. Zoom lenses typically have more distortion than prime lenses and usually show barrel distortion (image bulges outward) at the wide end, which transitions to pincushion distortion (image pinches inward) at longer focal lengths. Barrel distortion generally increases with the breadth of the zoom range, meaning superzoom lenses tend to be among the worst offenders. The example below shows the EF-M 18-150mm lens' distortion at select focal lengths across the zoom range. At 18mm, there is fairly strong barrel distortion typical of superzoom lenses. This quickly transitions to pincushion distortion by 35mm. The pincushion distortion persists through the rest of the focal length range, although it is somewhat reduced at 150mm. Distortion can be corrected during post-processing, but the tradeoff is a loss of pixel-level sharpness at the edges of the image where the greatest amount of correction is needed. Bokeh refers to the quality of the out-of-focus areas of an image, a characteristic for which there is no objective evaluation. Subjectively, the bokeh of the EF-M 18-150mm is not very good. As seen in the first example below (31mm f/6.3), there is a very bright outer ring and substantial 'onion-ring' bokeh, concentric circles in the out-of-focus highlights that are a result of the way the aspherical elements in the lens are produced. The bokeh can also be somewhat 'nervous' as shown in the second example below (18mm f/6.3). The rounded aperture blades keep the highlights round as the lens is stopped down. The bokeh becomes smoother and thus improved at the telephoto end of the focal range. 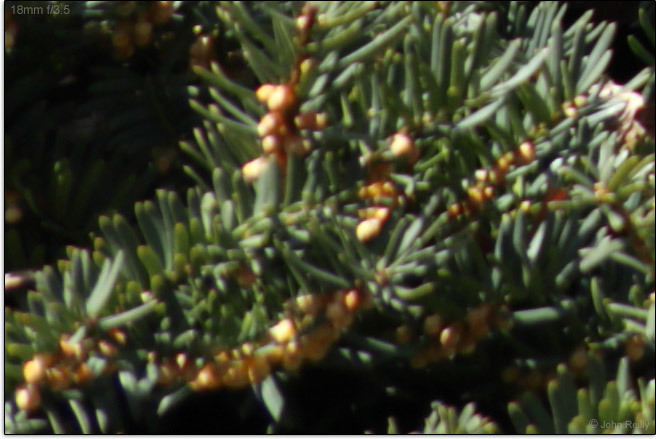 Additional examples of bokeh at multiple focal lengths and apertures can be seen in the longitudinal CA examples above. The CA test examples were taken at a much closer distance (approximately 1 yard / 0.91m vs. the 10 - 30 yards / 9.1 – 27.4m for the real-world examples above), which results in a smoother appearance of the bokeh. From an overall image quality standpoint, the worst performance is at the wide end of the focal length range, with soft corners wide open, noticeable distortion and moderate CA, but the performance at the wide end is similar to many variable aperture general purpose zoom lenses. The bokeh is a bit rough and the lens has a propensity for flare, but overall the EF-M 18-150mm delivers a surprisingly good performance, particularly for a superzoom lens where optical compromises are the norm. Like all EF-M lenses to date, the EF-M 18-150mm autofocuses using a stepping motor. STM focusing provides smooth and quiet focusing, which is an advantage when shooting video, but comes at the cost of slightly slower focusing compared to Canon's ultrasonic motors. The EF-M 18-150mm is internal focusing and the filter threads do not rotate with focusing (beneficial when using a circular polarizer filter). A feature common to all STM lenses is full time manual focusing, although the implementation is not necessarily ideal. Because STM lenses use electronic manual focus (aka focus-by-wire), the lens must be mounted on a camera that is actively metering for turning the manual focus ring to have an effect. There is no AF/MF switch on the lens barrel, so focusing method can only be changed by using the camera's buttons or menu options. The lens lacks a distance scale/window, and because of the focus-by-wire system, the manual focus ring does not have any hard stops, but rather can be continuously rotated through the full 360°. The manual focus ring of the EF-M 18-150mm lens is positioned at the very end of the barrel and is slightly less than 0.5" (12.7mm) long, with the outermost 0.12" (3mm) having a textured surface. The EF-M 18-150mm lens, like other STM lenses, has a variable focus throw – the amount by which the focus ring must be rotated to go from infinity to the minimum focus distance varies depending on how fast you turn the ring. With a fast manual rotation speed, the focus ring must be rotated 150° to rack the lens through the full focusing range, while a slow rotation speed requires a rotation of 240° to cover the same range. The idea behind this is to allow faster manual focusing with a shorter focus throw when moving between close and distant subjects, while also allowing precise fine-tuning of manual focus with a longer focus throw. The EF-M 18-150mm lens' autofocus is reasonably fast and accurate, which is typical for STM lenses. Tracking moving subjects with AI Servo AF is similarly fast and accurate, although the f/6.3 maximum aperture at the long end means that ample light is needed to achieve action-stopping shutter speeds. Those using the lens for shooting video will appreciate the its minimal focus breathing, meaning the framing does not change significantly when changing focus distance. On the downside, the reviewed EF-M 18-150mm lens is not parfocal (or even close to it), so if you adjust the focal length to reframe a shot, you will need to refocus the lens. At the wide-angle end, the EF-M 18-150mm lens has a minimum focusing distance of 9.8" (250mm) and a maximum magnification of 0.10x. 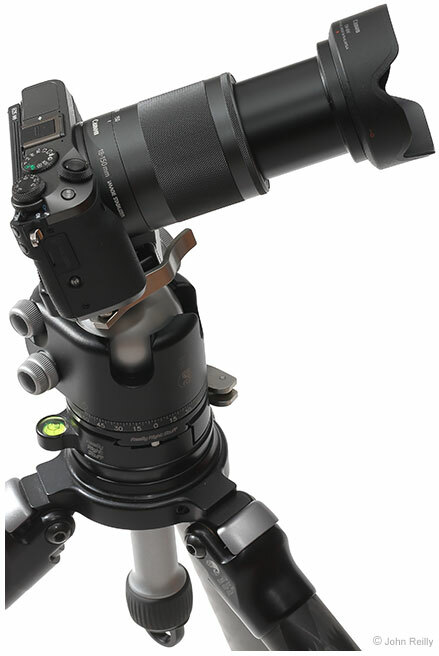 At the telephoto end, the MFD is 17.7" (450mm) yielding a maximum magnification of 0.31x which puts the EF-M 18-150mm in the mid-range for comparable lenses. The uncropped example below shows the maximum magnification delivered by the EF-M 18-150mm lens. 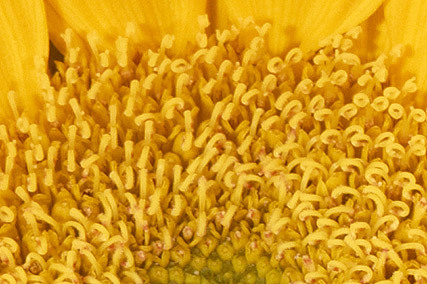 Higher magnifications could be obtained by using extension tubes. Although Canon does not make EF-M extension tubes, there are third-party extension tubes available for the EF-M mount. Canon's EF-M series of lenses share many common features, most notably a compact size which makes them fitting companions for Canon's relatively compact (compared to a DSLR) mirrorless cameras. In addition to their small size, which includes a common lens diameter of 2.4" (60.9mm), they have a minimalist design with few or no control switches on the lens barrel and share a uniformly good build quality. The more recent EF-M lenses, including the EF-M 18-150mm lens, have an exterior body made of polycarbonate with diamond-textured zoom and focus rings that are flush with rest of the lens barrel. The EF-M 18-150mm has a solid feel in the hand that is consistent with the good build quality. Most of the length of the lens barrel is occupied by the 1.8" (46mm) zoom ring, of which 1.3" (33mm) has the typical EF-M lens diamond texture. There are no controls on the lens itself other than the zoom and focus rings. Image stabilization and AF/MF settings are controlled via the camera menus/buttons. Zooming the lens from 18mm to 150mm requires a 90° rotation of the zoom ring which extends the inner barrel of the lens by 1.66" (42mm). Zoom extension is smooth with little play. Although the lens does not extend on its own due to gravity, if the camera is swung rapidly, the inner barrel will extend a bit. Among comparable lenses, the EF-M 18-150mm is the smallest and lightest. For many more comparisons, review the complete Canon EF-M 18-150mm f/3.5-6.3 IS STM Lens Specifications using the site's Lens Spec tool. Below is a visual comparison of a selection of the above lenses. 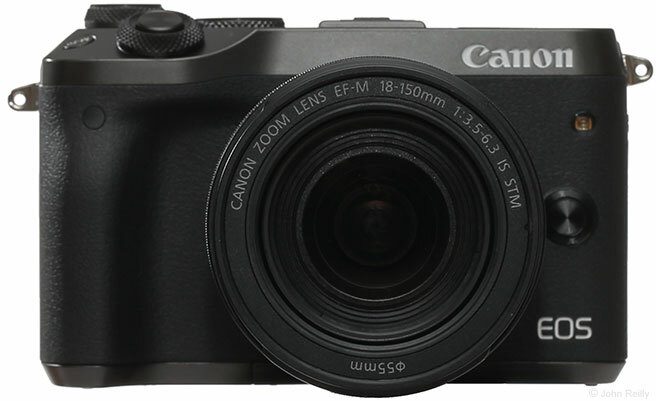 The Canon EF-M 18-150mm natively mounts on Canon EOS M series cameras, but using Canon EF, EF-S or third-party lenses for Canon DSLRs requires the use of the Canon EF-EOS M Adapter. The lack of a reflex mirror means the mirrorless cameras can have a much shorter flange focal distance – the space between the lens mount and the sensor. 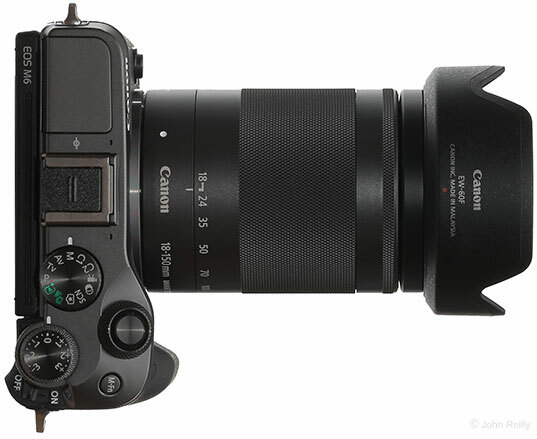 For the EOS M series that distance is 18mm, compared to 44mm for the Canon EF/EF-S mount. The EF-M mount adapter provides the additional distance needed between the lens and the sensor to compensate for the shorter flange focal distance of the mirrorless cameras. As such, for lenses other than the Tamron 18-200mm f/3.5-6.3 Di III VC Lens, a true comparison means adding an extra 3.7 oz (105g) and 1.2" (31mm). The same lenses are shown below with zoom barrels extended and hoods in place, and as they would be mounted on an EOS M camera with the mount adapter on EF/EF-S mount lenses. 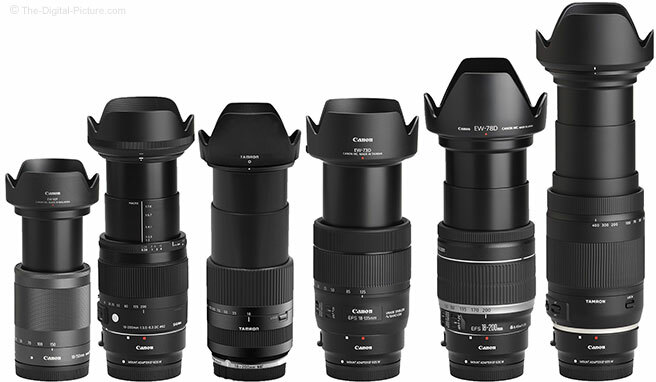 Use the site's product image comparison tool to visually compare the EF-M 18-150mm to a variety of other lenses. The EF-M 18-150mm accepts front filters with a 55mm diameter. While not a common size, filters of that relatively small diameter are not very expensive. There is one other current Canon lens which uses the same 55mm filters, the EF-M 11-22mm f/4-5.6 IS STM Lens. That works out quite well because the combination of the EF-M 11-22mm and EF-M 18-150mm covers an enormously broad and useful focal length range, and for that reason, my space-limited travel kit comprises the EOS M6 and those two lenses along with 55mm circular polarizer and 10-stop ND filters, all of which fit in a Think Tank Photo Mirrorless Mover 10. Threading a standard protective filter or slim circular polarizer onto the front of the EF-M 18-150mm has no effect on vignetting, while mounting a standard CPL results in a very slight increase in vignetting at the wide end of the focal length range. As such, a thin-framed CPL (such as the B+W XS-Pro line) would be an ideal option. Lens hoods reduce the impact of flare resulting in increased image contrast and also offer some physical protection to the front of a lens. The optional Canon EW-60F Lens Hood is designed for the EF-M 18-150mm. Like the other EF-M zoom lens dedicated hoods, this is a no-frills hood with no interior flocking or ribbing to reduce reflections, but it fits perfectly and mounts/unmounts easily. Canon recommends the optional Canon LP816 Lens Pouch for this lens, but personally, I think that pouch is far too big for the EF-M 18-150mm. The Lowepro Dashpoint 20 is a perfect fit for the lens with hood reversed, and the Lowepro Lens Case 8x12 is another reasonable alternative. The EF-M 18-150mm is the most expensive EF-M lens released to date, but since it delivers the focal length coverage of a general purpose zoom plus a telephoto zoom, and is cheaper than those two lenses combined, it can be considered a good value from a price standpoint. It also delivers very good optical performance in a conveniently portable size which certainly adds to the lens' value. If you're only going to bring one lens, the EF-M 18-150mm can enable you to capture a wide variety of perspectives and images, and that can be priceless. 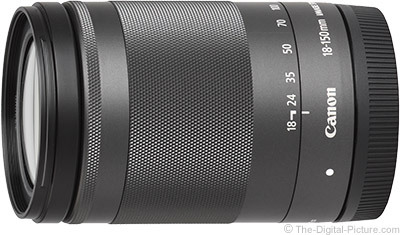 The reviewed Canon EF-M 18-150mm f/3.5-6.3 IS STM Lens was purchased online/retail. The one-lens solution offered by a superzoom lens makes them popular with many consumers, and as a result there are a variety of lenses in this class from which to choose. Relatively rare for EOS M series bodies, there is even a third-party option with a native EF-M mount. For those that have or are willing to purchase the Canon EF-EOS M Adapter, there are several additional options to consider, some of which are discussed below. The most directly comparable lens is the Tamron 18-200mm f/3.5-6.3 Di III VC Lens for the Canon EF-M mount, with a price equivalent to the Canon EF-M 18-150mm lens. The Tamron lens was originally developed for the Sony E-mount prior to the launch of Canon's EOS M series and was released in the native Canon mirrorless mount two years prior to the launch of the EF-M 18-150mm, leaving the Tamron lens as the only native mount superzoom option for the EOS M series for quite some time. The most obvious difference is that the Tamron lens offers an additional 50mm of focal length on the telephoto end. Despite the native mount and similar maximum apertures, the Tamron lens is noticeably larger and over 50% heavier than the EF-M 18-150mm. The Tamron lens delivers similar sharpness across the range, slightly less distortion and more CA (particularly at the long end). The zoom ring on the Tamron lens rotates in the opposite direction from Canon lenses, something that can take some getting used to particularly for those switching between Canon and third-party lenses. Both lenses offer the same claimed 4 stops of image stabilization. Like the EF-M 18-150mm, the Tamron lens also uses a quiet stepping motor but AF performance is slightly better with the Canon EF-M 18-150mm, particularly when tracking subjects in AI Servo. Because third-party manufacturers must reverse-engineer Canon's lens communications protocols, there is always the possibility of future compatibility problems as new bodies are released. The Canon EF-S 18-135mm f/3.5-5.6 IS USM Lens is the closest Canon equivalent in terms of focal length range. The two lenses deliver similar sharpness across their focal length ranges. Vignetting is similar at the wide end, slightly lower for the EF-S 18-135mm at the long end and the EF-S 18-135mm lens has slightly less distortion. Both lenses have issues with flare, but not in quite the same way – the EF-M 18-150mm is more susceptible to discrete flare artifacts (colored shapes) while the EF-S 18-135mm shows more of the veiling glare that reduces contrast over the entire image. The NanoUSM autofocus motor in the EF-S 18-135mm focuses slightly faster than the STM autofocus of the EF-M 18-150mm, although it is still a focus-by-wire implementation. The Canon EF-S 18-200mm f/3.5-5.6 IS Lens was Canon's original APS-C superzoom lens. Although shorter by 50mm on the telephoto end, the EF-M 18-150mm is sharper across the focal length range, has less distortion, less CA, similar vignetting and less flare. In other words, the EF-M 18-150mm lens delivers better image quality across the board. 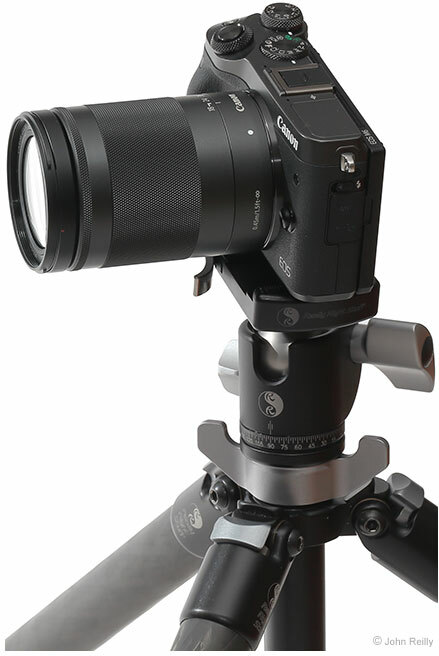 The EF-S 18-200mm uses a micromotor for AF which is slower and noisier than STM. The EF-S 18-200mm is bigger, heavier and more expensive; for those who already own one, adapting it may make sense, but for those looking to purchase a new superzoom, it is not likely the best choice. 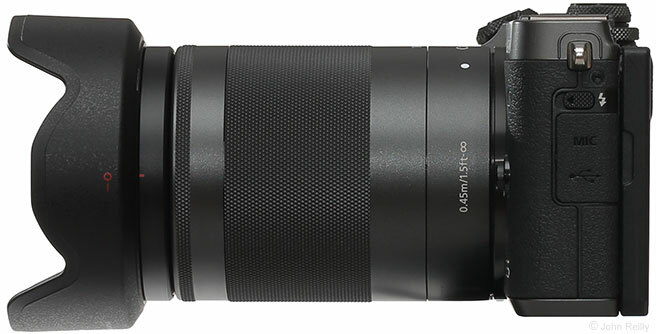 The Sigma 18-200mm f/3.5-6.3 DC OS HSM C Lens is among the least expensive superzoom options. It is heavier than the EF-M 18-150mm although not much bigger (until you factor the mount adapter into the length) and obviously offers an extra 50mm of reach on the long end. Overall, the EF-M 18-150mm delivers better image quality, and in my opinion, the modest cost savings are not worth the tradeoff of lower IQ and a non-native mount. Those looking for a focal length range more super than a typical superzoom should consider the Tamron 18-400mm f/3.5-6.3 Di II VC HLD Lens. The 22x zoom range is impressive, although the optical performance is less so and it is a significant step down from the EF-M 18-150mm in the overlapping focal length range. A lens this size can be a challenge to use comfortably on a relatively small mirrorless body, but if a 400mm focal length is important for you, the extreme zoom range and convenience of having wide angle to supertelephoto in one lens may be worth the cost, size and image quality compromises. Superzoom lenses typically represent a compromise between the convenience of a single lens with a diverse array of uses and the image quality tradeoffs necessary to make the lens compact and affordable. With its small size, light weight and broad focal length range, the EF-M 18-150mm is heavy on convenience with surprisingly good image quality, making it light on compromise, and… it's also relatively light on the wallet. For EOS M series owners looking for the One Lens, the Canon EF-M 18-150mm f/3.5-6.3 IS STM Lens might just be the precious choice.